I’m writing this post because I’m a member of the Shropshire branch of Global Justice Now! 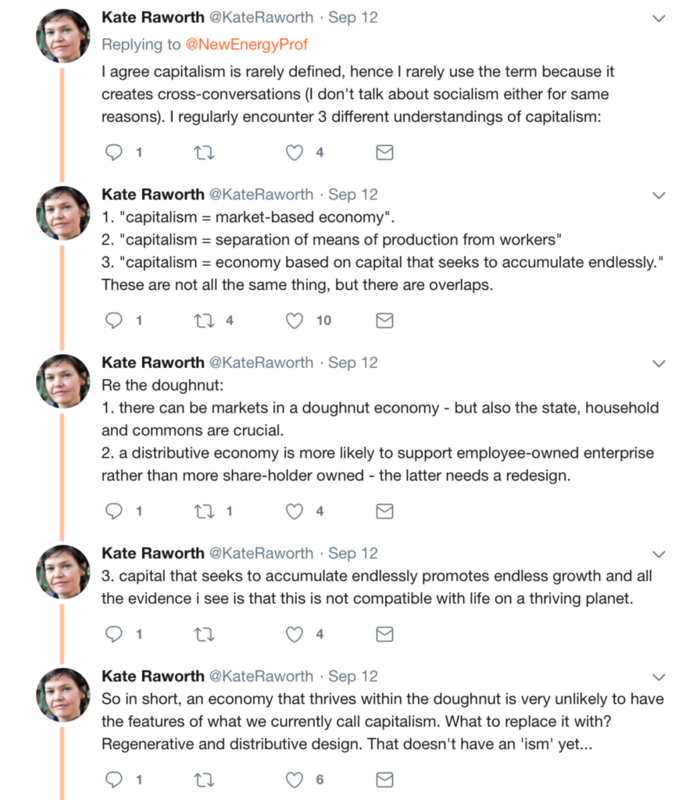 We’ve started a reading group and Kate Raworth’s book Doughnut Economics: Seven Ways to Think Like a 21st-Century Economist [DE] was first on the list. I read the book and made some notes (page numbers in brackets refer to the pbk Random House edition, 2017). These are they. It’s good advice to read Adam Smith in the original (rather than base your understanding of his work on second-hand economic punditry) because the author of The Wealth of Nations is notoriously misintepreted. However, I didn’t have time to do that, so I’m going to stick with tradition and base my understanding of his work on second-hand economic punditry (but see this blog post in the Economist on how Smith didn’t argue that humans were entirely motivated by self-interest). Who hasn’t read this quote of Smith’s: “it is not from the benevolence of the butcher, the brewer or the baker that we expect our dinner”. I love Raworth’s aside: “he forgot to mention the benevolence of his mother, Margaret Douglass, who had raised her boy alone from birth” (p 79). Asides aside, this is a fundamental argument of DE: the importance of the household is core to the economy but overlooked by mainstream economics. According to Raworth, 20th Century ‘mainstream’ economics lost its sense of purpose, and for many of its proponents this was (and still is) a good thing. If economics was/is to have scientific rigour, if it was/is to concern itself solely with the relationship between ends and scarce means, or the utility to be derived from an abstract basket of goods (it is ironic that online behemoth Amazon has done so much to imprint the term ‘basket’ onto our sub-conscious), then it was/is entirely appropriate for the discipline to lose – and not find – its social conscience. Raworth wants to bring that social conscience back in from the cold. ‘Mainstream’ refers to the still commonly held view of economics as a closed system, much like the plumbing in your house. Investment (water, to continue the metaphor) enters the system from some mysterious, undefined source; gets converted into things like wages, interest, etc. ; swirls around the system, paying for public services and private businesses; and some savings get pumped out the other end. No need to worry about where the investment (water) comes from, or where it ends up. “A world in which every person can lead their life with dignity, opportunity and community – and where we can all do so within the means of our life-giving planet” (p43). To answer that question requires a “compelling alternative frame” (p23). I’m a big fan of George Lakoff, so it was nice to see her draw on his work in her book. Lakoff has done more than anyone to show how, perversely, collective heels dig-in when faced with counter-arguments or evidence purporting to demonstrate that your long-held beliefs are actually wrong. So what could be more compelling than a pastry-based alternative frame? 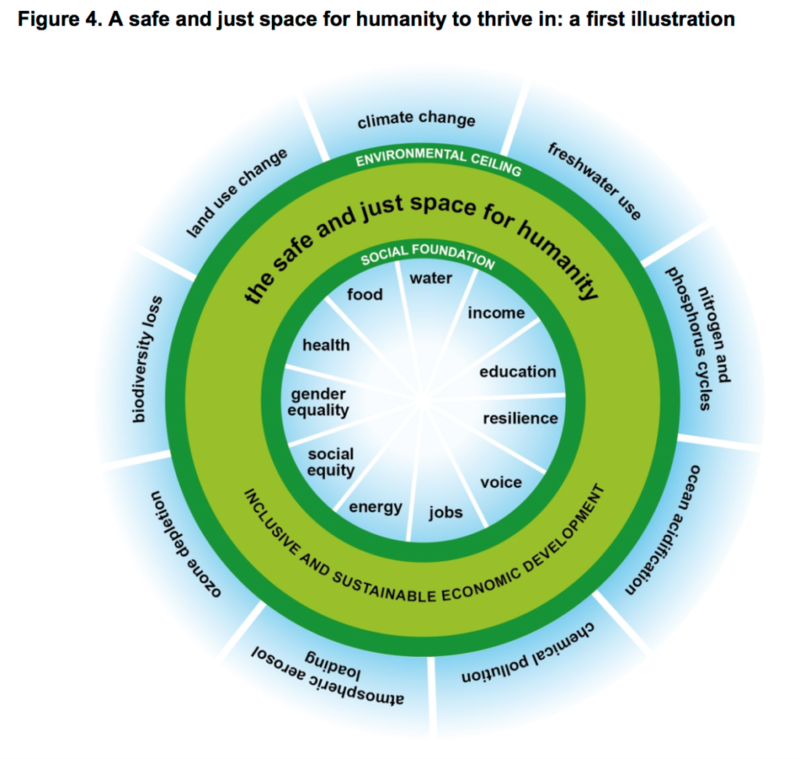 I remember reading Raworth’s Oxfam discussion paper A Safe and Just Space for Humanity: Can we live within the doughnut when it came out in 2012. The title is a nod to Johan Rockstrom et al’s analysis of planetary boundaries published three years earlier, and described by the authors in the journal Nature as A safe operating space for humanity. Raworth’s analysis in that discussion paper lays the foundations for what has become Doughnut Economics. In addition to pointing out that mainstream economics has lost its sense of purpose, she argues for the discipline to develop a moral compass – she is, after all, describing a safe and just space for humanity. 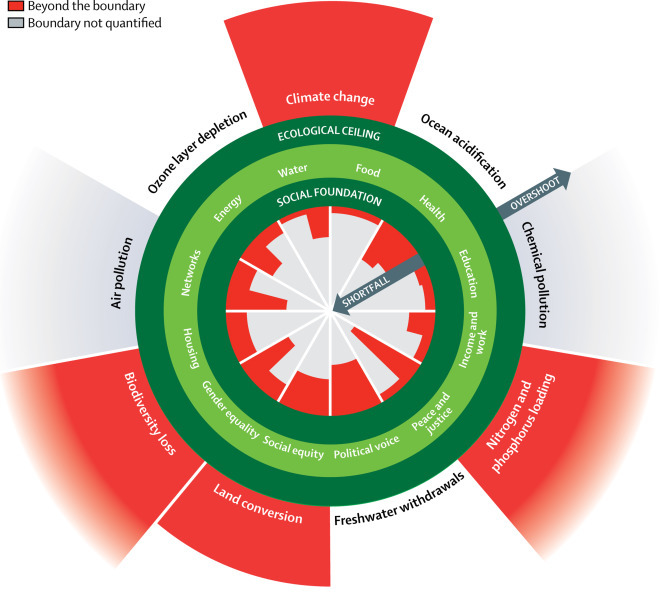 Her analysis integrates planetary boundaries and social foundations, explaining how social, environmental and political factors are interlinked. 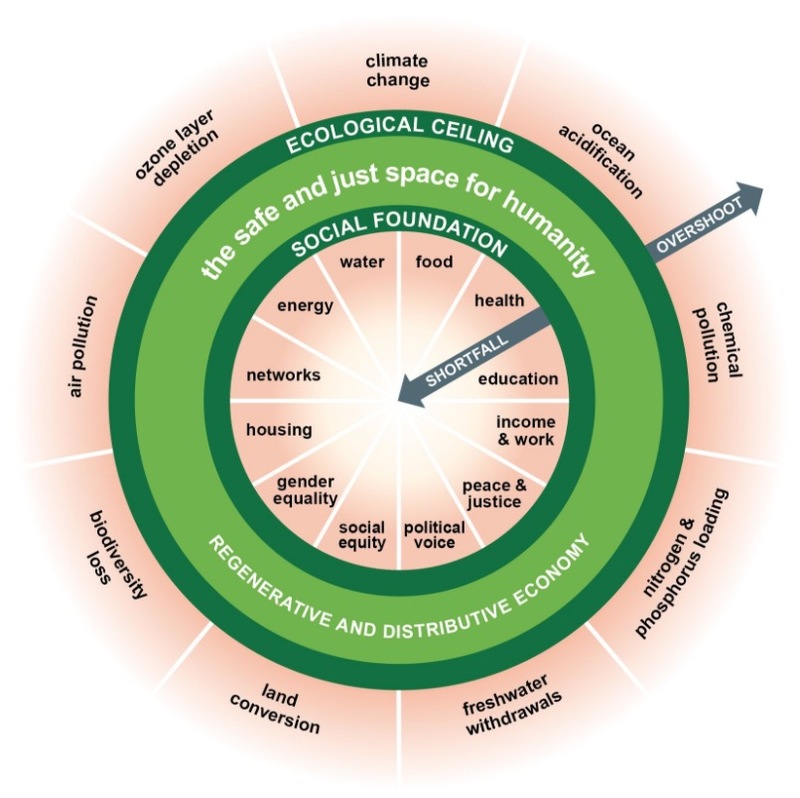 The image she used then, and which has captured imaginations since, is a doughnut – two concentric rings – comprised of 9 environmental factors that constitute the outer ring (or ceiling), and 11 social factors constituting the inner ring (or floor). The overall message is that sustainable development can only be achieved if we don’t put a hole in the ceiling and don’t fall through the floor. “Human prosperity in a flourishing web of life” (p55). I was aware of the ceiling (planetary boundaries) in 2009, and have explored the floor (social determinants of health) with students throughout my professional life. But thinking about sustainability in terms of both is neat, and it makes two highly complex areas of work accessible and manageable. I am certain that Raworth will be more than familiar with critiques, objections, and ‘yes-but’ type retorts to her analysis, so I won’t be saying anything new here. However, if I were to ever meet the author, I’d probably ask her about a couple of things. The method Raworth employs in her 2012 Oxfam discussion paper – where she derives 11 social factors – is a standard content analysis of 80 submissions submitted by governments prior to the 2012 Rio+ 20 UN Conference on Sustainable Development. They were chosen because they are those factors mentioned in more than 50% of the submissions (p 21 of the discussion paper). It’s interesting to see which factors have stood the test of time (or, rather, survived the arrival of the SDGs). In the 2012 paper they were: Food, water, income, education, resilience, voice, jobs, energy, social equity, gender equality and health (see above). In the 2017 book, they are: Food, water, income and work, education, networks, political voice, energy, social equity, gender equality, health, housing, and peace and justice. The observant among you will have noticed that the 12 factors are actually 15, and there are a couple of ideas (equity and equality) plus an adjective (political). As tends to happen with doughnuts, one’s waistline expands if one eats too many. Frameworks work best when they retain a degree of simplicity – is this one becoming unwieldy? From a professional perspective, it’s twitch-inducing to see someone fiddle with their method (it makes comparison between studies problematic). Beyond a note in the book’s Appendix explaining that the 12 factors for the book “are derived from the social priorities specified in the United Nation’s 2015 Sustainable Development Goals” (p295), there’s nothing in Table 1 of the appendix that helps the reader to make sense of the figure on p51 (above), arguably the most important figure in the book. There’s more by way of explanation in a Comment in the Lancet – and in an accompanying Appendix. A link in the book to that analysis would have been helpful. Income and Work uses a poverty line of $3.10 per person per day rather than the more familiar $1.90. Great, but it does suggest that the author is picking and choosing which definitions of a social indicator she prefers. Poverty reduction is – wrongly IMO – the poster child of the SDGs precisely because it does use the World Bank data. And if you’re going to use the World Bank as a resource for development indicators, which in itself is problematic, it seems a little curious to be choosing some of its indicators, but not others, because you don’t happen to like a cut-off point. Peace and Justice. In many cases, you really have to use your imagination to see the indicators utilised as proxies for each element of the doughnut’s social foundation. Peace and Justice is measured against two indicators – Population living in countries scoring 50 or less out of 100 in the Corruption Perceptions Index, and Population living in countries with a homicide rate of 10 or more per 10,000. Do those indicators give you much of a sense of either peace or justice in your country? Reinforcing feedback loops are really important to 21st century economists because they can (and do) amplify what you have if left unchecked. This is a problem when you consider just how much wealthier than everyone else a handful of wealthy men have become, or if you consider the consequences of GDP growth (at 3% growth, an economy will triple in size by 2050) for finite resources, or carbon emissions and global warming. But they can also offer regenerative and redistributive opportunities. Instead of the linear ‘caterpillar’ economy with which we are all familiar (take > make > use > lose), Raworth argues for a circular economy that regenerates and restores, whilst recognising that its potential is as yet unrealised. I love the idea of “generous cities”, for example, even though “no such city can yet be found on a map of the world” (p234). Realising that potential requires a couple of key actors (pp 68-69), and this is where I find it hardest to swallow the doughnut. If only that were true! Today’s most innovative enterprises (depending on scale and concept) really aren’t inspired by that idea, are they? Apple is large scale, so is Dyson – to name two pretty destructive but widely-acknowledged-to-be innovative corporations. This is an example of wishful thinking masquerading as actual practice. Some enterprises may be inspired by this idea, but I doubt many are (or if they admit to a commitment to ‘thriving’, then that commitment is understood in monetary terms). For another, Raworth puts the State (“which is essential, so make it accountable”) at the centre of the 21stcentury economy (alongside the household, commons and the market – see her diagram on p71). Quite a few of Raworth’s arguments are couched in terms of “if X was the case, then Y would follow”. For example, if finance (X) was in ‘the right relationship’ with the whole economy (p235), aided by state-led development banks, then Y will follow; or, if the state (X) can be a “transformative partner in creating a regenerative economy” (p 239), then Y will follow. The problem is, neither is the case: finance isn’t aligned and the state isn’t a transformative partner. Quite the opposite in fact. And it’s not for want of trying. The anti-(economic) globalisation movement of the early 2000s and the Occupy Movement a decade later grew out of frustration at the extent of the mis-aligned economy. And opposition to the State has been a leitmotif of political activism for centuries. States are brutal institutions and they exist for a reason. There’s a feedback loop here that 21st century economists really need to consider. An actor (of a sort) in the play, that isn’t given any prominence at all, but which definitely features in the wings, is capitalism. Do a word search; you won’t find any reference to it in either the discussion paper or the book. Raworth has tweeted about it and, of course, it’s something that she’s considered (see below and thanks to @NewEnergyProf for asking the question). I can understand wanting to avoid “cross-conversations” (cross, as in angry, or across, as in talking across one another and thus never finding common ground?) but in doing so, doesn’t one ignore the elephant in the room? Raworth’s chapter (6) on regenerative and distributive design – ‘Create to Regenerate’ – introduces a set of metrics you’d really want to fight for. You want to rate your urban landscape, so “record the rates at which it harvests solar energy, sequesters carbon, stores rainwater, fertilises soil, purifies the air, and more” (p223). On growth: reframe the debate – tax justice and public investment; end tax loopholes and offshore tax havens; tax wealth not income; introduce a shorter working week; develop new metrics such as the human development index; if collective action problems are holding you back, start a new game; ban advertising to kids under 12 (Ch 7). This is a worry, perhaps the worry that prevents people from taking that all-important first step. What if…everything falls apart? Here, I would look at the ongoing direct action in London in response to climate breakdown for inspiration. The Extinction Rebellion movement is motivated by a recognition that the “political underpinnings of our world” are unfit for purpose – the political system is not responding as it should. So Wolf is right – politics and economics are intimately connected. Now that we know what a 21st Century economy looks like, surely it is time to rebuild a politics to go with it? We thought that a 21st Century economist needed to ‘think like a child’. By which we don’t mean childish, but rather to incorporate into her thinking insights from a younger generation. Much of the movement for change these days is coming from school children; a 21st Century economy should be based on principles that are meaningful to them. Is there a feedback loop in your doughnut that can tap into those insights, Kate? Next Post Hans Rosling: The Gradgrind of Global Health?